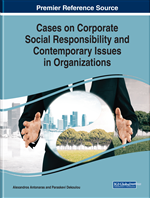 The chapter begins by defining corporate social responsibility and explains its close relationship with environmental sustainability. Then discussion focuses on defining and explaining the underlying principles of environmental sustainability and examining it from a marketing orientation perspective arguing that a strong marketing orientation has the potential to motivate businesses to engage in environmentally sustainable business practices. The chapter then provides some empirical evidence derived from an exploratory case study carried out in Cyprus aimed at revealing the perceptions and experiences of managers of four large and four SMEs regarding the practice of environmental sustainability. Corporate social responsibility (CSR) has acquired an unquestionably high degree of importance for businesses and their stakeholders over the last decades. Businesses are developing best practices for building socially responsible competences in response to increased consumer concerns regarding unethical and irresponsible business activities. There is also heightened concern for the natural environment among consumers, which encourages businesses to adopt sustainable marketing and through that demonstrate greater social and environmental concern to meet the present needs of consumers and businesses while also preserving or enhancing the ability of future generations to meet their needs (Kotler and Armstrong 2018). Some businesses have been quick to accept concepts like environmental sustainability, and have integrated environmental issues into their organizational activities. Others though have stayed behind. Responsible managers must assess whether their actions are sustainable not only at present but also in the long run. Sustainable marketing demands for socially and environmentally responsible actions that meet the present needs of consumers and businesses while also preserving or enhancing the ability of future generations to meet their needs. The increased trend for customers to become more environmentally aware and demand eco-friendly products and services, can stimulate the adoption of a market orientation within an organisation. It can also have the potential to give to the firm the ability to identify this change in customer demand and the ability to respond by implementing environmentally sustainable business activities such as green supply chain management practices. Market orientation is not inherently an environmental sustainability strategy. Effort needs to be invested in researching customers’ needs and using this knowledge and understanding to develop appropriate business strategies and practices. Over the years, growing attention has been given to the ethical, environmental and social dimensions of business, most often under the CSR umbrella. There are many different views on what social responsibility entails. Kolk, (2010) claims that: “definitions abound, no clear consensus regarding the exact meaning, while various new/related (sub) concepts have been emerging as well.” A possible distinction can perhaps be made between those definitions that perceive CSR to encompass activities to advance a social cause beyond compliance (e.g. Portney, 2008, Rodriguez et al., 2006), and those that do not focus so much on the voluntary nature beyond the law but rather, more broadly, as managing a firm in such a way that it can be “economically profitable, law abiding, ethical and socially supportive” (Carroll, 1999, p. 286). It seems though that overall, Votaw's 1973 characterization still seems valid: “The term (social responsibility) is a brilliant one: it means something, but not always the same thing, to everybody. To some it conveys the idea of legal responsibility or liability; to others, it means socially responsible behavior in an ethical sense; to still others, the meaning transmitted is that of ‘responsible for’ in a causal mode; many simply equate it with a charitable contribution…a few see it as a sort of fiduciary duty imposing higher standards of behavior on the businessmen than on citizens at large.” (quoted in Carroll, 1999, p. 280).